Larson, longtime maker of runabouts, announced last spring that it was moving out of its Little Falls, Minnesota, plant and will share space with its sister brands—Carver and Marquis—at their Pulaski, Wisconsin, facility. According to published reports, Larson will have to repay the $190,500 balance on a $500,000 loan from Little Falls Economic Development Authority. In a November e-mail, CEO Rob Parmentier cited “adverse economic dynamics and shifting changes within the marine market that require us to consolidate our company’s operations and footprint with our sister organization in Pulaski.” Lagging sales of sterndrives and the strong U.S. dollar also were cited by Parmentier. In the Minneapolis-based StarTribune an article noted that Larson had managed to “hang on” through the Great Recession that began in 2008, the 2009 bankruptcy of parent Genmar Holdings, and the sale of the Little Falls plant in 2010 from Genmar to Irwin Jacobs and a partner. Larson employs more than 100, and they will be offered jobs in Pulaski; Parmentier said the company will charter a bus so personnel can visit the Wisconsin facility to help them decide whether to make the move. The VEC closed-mold process employs lightweight composite molds supported by water inside a metal pressure vessel. The “cell” can be operated by one person. The system was developed by inventor Gene Kirila, who built a plant in Greenville, Pennsylvania, and later sold the technology to Irwin Jacobs, then head of Genmar Holdings, which at the time produced the Larson and Glastron brands, among others. Still settling from the recession, in September 2011 Jacobs sold VEC Technology as well as J&D Acquisitions (a boat company), FLW fishing tournaments, and a sandbag business to Liquidity Services Inc., a Washington, D.C.–based dealer in surplus goods, for $140 million. Somewhere along the way, Jacobs must have reacquired VEC, because in 2013 he announced a new pontoon boat called Escape to be built with VEC at the Larson plant in Little Falls. Matthew Vetzner, marketing manager for Larson, said the company has built the Escape pontoon boats but not with VEC, and that Larson has stopped using VEC because lower volumes made it economically unfeasible. The boats are now hand-laid in open molds, and that method will continue after the move to Pulaski. 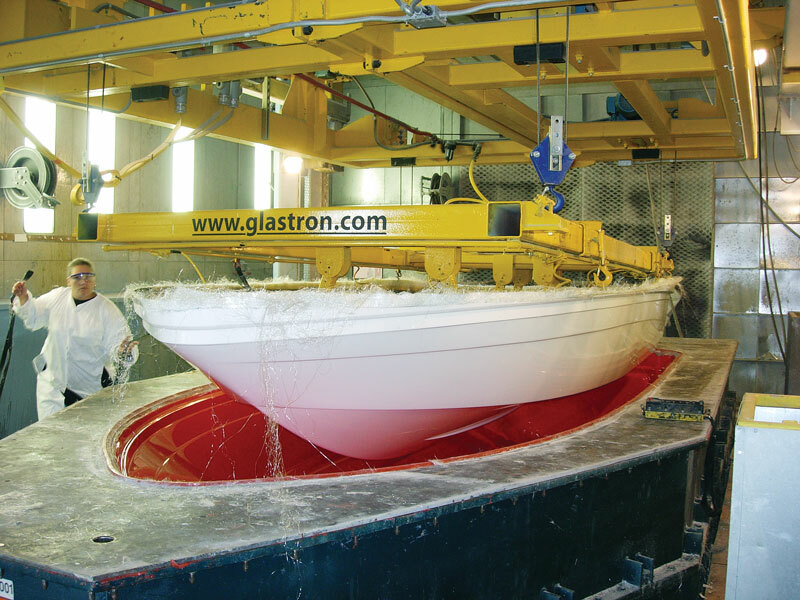 There, Vetzner said, Larson boats will benefit from the more advanced composite processes employed by Marquis and Carver; these include resin infusion and resin transfer molding (RTM), depending on the part. Larson’s move to Pulaski should be completed by the time this issue of PBB is published. As for the Little Falls plant, Vetzner said it has been sold to Wabash National (Lafayette, Indiana), which will utilize VEC technology in making some of its truck bodies, trailers, and other parts for diversified industries.